Morningside Park residents Claira McLean, James Liles, Pat Harris, and Ellween Rhone enjoy the comort and ease of their new ENERGY STAR-rated HVAC units. 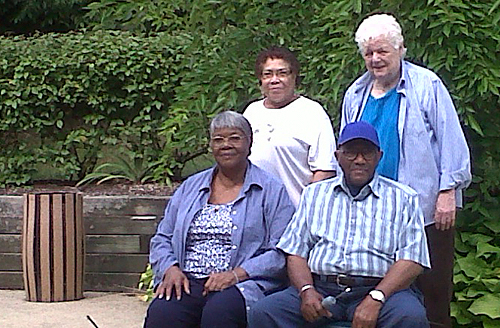 Thanks to a 2011 EmPOWERING Clean Energy Communitiesgrant from the Maryland Energy Administration (MEA), residents at Morningside Park are more comfortable. The 60 unit senior community in Howard County received energy efficiency upgrades using funds acquired from an MEA grant to the Howard County Housing Commission (HCHC). As part of the upgrade, HCHC replaced all HVAC units in the bulding. MEA awarded $36,500, which covered the cost of replacing 13 units with 1.5 ton ENERGY STAR-rated HVAC units. The new units are not only more efficient, but also use less capacity to deliver the same level of performance and comfort as the old units. The new HVAC units use 40% less energy, and are estimated to save more than 54 megawatt hours (MWh) annually. To understand the impact of this savings, consider that 54 MWh is equivalent to saving the electricity consumed by 4 typical Maryland homes in one year, or taking 5 and a half cars off the road for a year. For Doris Sturiale, a Morningside Park resident, the grant has helped to make her summers more enjoyable. She told HCHC’s Chief of Development Finance & Project Management, Cynthia Lynch, “When it gets hot outside, the new air conditioning comes in handy and keeps me nice and cool.” Other Morningside Park residents expressed a similar sentiment. This grant program is part of the EmPOWER Maryland initiative, and is funded through the Strategic Energy Investment Fund (SEIF). SEIF funds come from the Regional Greenhouse Gas Initiative (RGGI). The SEIF fund statute requires that at least 46% of funds be used for energy efficiency and conservation programs, projects, or activities, and demand response programs. Half of is allocation is targeted to low-to-moderate income Marylanders. The grant funds were divided among the Maryland Counties, with $36,500 available for Howard County in FY 2011.